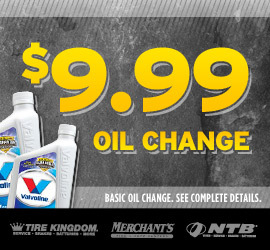 Go here and print this coupon to get a $9.99* oil change at NTB. That’s the best price I’ve seen in a while! Most vehicles. Not valid with other offers. One coupon per customer. At participating locations upon presentation of this ad. See store for details. Expires 5-15-11. *Plus $3.00 disposal fee (where permitted). **Other oils available at additional cost. ***TPMS reset additional, if needed.